No More Room, Martin Houses are Full! Naples has just reported the first SY (subadult) Purple Martin of the season on 2/19 so I predict that nesting will be beginning at anytime, here in Florida.Keep playing that purple martin dawnsong and be ready for more birds, all wannabe landlords. Don’t give up! The last few nights I have seen birds get turned away as night falls. I can almost swear (if I was the swearing type) that more than 2 birds are going into the same gourds. It seems several pairs are co-habitating at any given time. I have witnessed at least 4 birds enter a gourd last night and tonight, and unless these odd birds out are kicked out of the gourds after I go in, they must have stayed the night. I can assume it is not all to friendly in the gourd as I can see the gourd shaking a bit for a few minutes. I am torn as I consider putting up more housing, but then I remind myself that as many gourds or martin houses I put up, the birds would fill them. And do I really want a super colony? Well, actually that would be cool but between kids and tball and piano lessons and all the other “stuff” I would not be able to do them justice. Basically I wouldn’t be able to watch out for my birds the way I want. So until my kids are a bit older and can help with some of the purple martin things, the colony can stay as it is…well, maybe a few more gourds! The colony activity here in West Palm Beach has certainly kicked up a notch. The male purple martins are even heard singing while still in there gourds. I opened up the other gourd rack and filled them with pine straw. Artificial gourds should be filled with a few handfuls of pine straw to prevent them being unable to exit the slick plastic gourds. Even with the black traction strip in my Troyer Horizontal Gourds, they can be difficult, if not impossible to exit. So make sure you place some nesting material in those gourds. 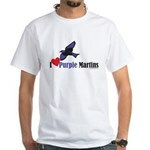 I know “some” ultra conservative birders may scoff at giving purple martins this help. They see it as unnecessary interference. But that thinking is flawed. It has nothing to do with altering nature but more to do with preventing a birds death by our hand. The Purple Martin colonycam is up and averaging about 90% up-time.